Badan Pusat Statistik - BPS or Statistics Indonesia is a central statistic agency of Indonesia. 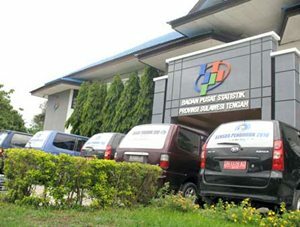 Badan Pusat Statistik is a non-ministerial government agency in Indonesia which has the main task as a provider of basic statistical data, both the government and to the general public, both nationally and regionally. According to information found in the Agency's website as cited by JobsCDC.com, Badan Pusat Statistik was formed based on Law Number 6 of 1960 concerning the Census and Law Number 7 of 1960 concerning Statistics. BPS is under and responsible directly to the President of Republic Indonesia. Badan Pusat Statistik is based in Jakarta and its head office is registered at Jl Dr Sutomo 6-8 Jakarta 10710. Badan Pusat Statistik now has 33 regional offices scattered in 33 provinces throughout Indonesia. Badan Pusat Statistik also supported by representative offices in all regency/city across the Country. Currently, the Head of BPS is Dr Suhariyanto. The Head of BPS is assisted by 5 deputy. Able to read sketch maps and digital maps (Google Maps) and know with the work area. Age around 18 - 55 years old. Able to communicate well and work in a team. Minimum Android version 4.0.3 with internal GPS. Minimum 1GB of internal storage. JobsCDC.com now available on android device. Download now on Google Play here. Please be aware of recruitment fraud. The entire stage of this selection process is free of charge. Badan Pusat Statistik Kab Semarang - Open Recruitment Sensus Penduduk 2020 BPS February 2019 will never ask for fees or upfront payments for any purposes during the recruitment process such as transportation and accommodation.